The home business of selling garden fruits, herbs and vegetables to local chefs and restaurants can range from a spare time summer project to a more serious on-going enterprise. I recall eating lunch at a restaurant where we sold our lettuces and edible flowers. What fun to see “our” flowers and lettuce being served to restaurant patrons all around us. Today, the possibilities of the local grower selling to area chefs are greater than perhaps any time in history. The local food revival is huge among consumers. Chef’s now want the kind of rare produce that wholesalers don’t supply, which are often also varieties that are so tender, only a gardener can properly harvest and deliver them. Not only do their foods look and taste far better, which draws in more loyal restaurant customers, but the customers themselves often support restaurants that list the local growers or farms that supply their produce. There are even chef-to-farmer programs now that help link growers directly to chefs, bypassing the middleman, and helping to create thriving local food economies. The Oregon-based Farmer-Chef Connection is one example. “The Farmer-Chef Connection, first created in 2001, is a replicable model that can be implemented nationally, and consists of a workshop, survey, and direct marketing guide,” says Debra Sohm, spokesperson. “The program promotes experiential learning and gives producers an opportunity to interact with chefs and retailers. Producers and buyers learn how to sell/buy to and from each other. 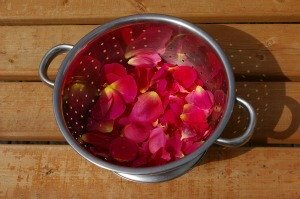 In the photo to the left, I have my edible flower rose petals ready to rinse, spin, and pack for the local chef. Selling to chefs isn’t for everyone. Some people prefer wholesale outlets for large quantities of a few staple crops. Others find that working with chefs carries some risk they don’t want to deal with, such as growing certain crops for a chef, to find out that just about harvest time, he gets fired or moves five states away to another restaurant. But these issues can be overcome in various ways, and for those who have, selling to chefs is a very valuable outlet for heirloom and gourmet garden crops. Farmer Adam's story: Adam Childs is the main farmer for Nettles Farm, a market garden in Washington State that grows for area restaurants. I asked Adam about the differences between farming for chefs and other types of market outlets, such as farmers’ markets. Farmer Adam and Chef Craig obviously have a trusting working relationship. They both understand the other’s needs and work demands. This is something to eventually aim for. 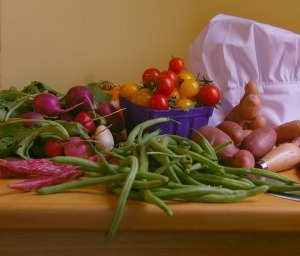 The above mentioned Farmer-Chef Connection helps both chefs and farmers understand each others’ needs, and if there’s not such a program near you, you may be able to find good information just from their website. They teach chefs that, in order to maintain local farm supplies, chefs must make sure their crops are purchased each season. Promises cannot be made lightly. Farmers also learn of the chef’s unique needs, such as when their peak tourist season is, when they may have V.I.P. dinners to serve, what days of the week are most rushed and in the most need. 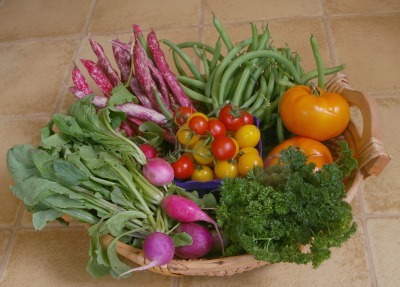 Here are some important tips for successfully growing garden crops for restaurants. Finding the right chefs: Usually, you will sell to the chef vs. to the restaurant. Sometimes, the chef owns the restaurant, other times, he or she is the one in charge of what is purchased and from whom. So for the most part, your first contact to a promising restaurant will its head chef, rather than, say, the restaurant owner or manager. If the chef is interested in your produce, he or she may then let you know if you must also contact the owner or another person involved in the restaurant. Search for high-end restaurants that follow sustainable trends and want unusual gourmet and heirloom varieties. You want the highest pay for your hard work. A fast-food franchise or a corner café that specializes in serving cheap food from under priced crop commodities will not be able to pay you what you deserve. And, these may not be able to, nor be interested in working with local growers. Also, consider the idea of professional personal chefs as possible outlets for your garden produce. These people go into the private homes of their clients to prepare meals for the family or for parties or other special occasions, and sometimes even to give the client gourmet cooking lessons in their own kitchen. These chefs are as varied as restaurants, some specializing in easy-to-get, low-priced surplus ingredients, and others in gourmet, heirloom, and local ingredients. So look closely at their profiles before approaching any. Making the first contact: For me and many other growers, there is nothing like taking in some fresh samples to get chefs excited about regularly buying from us. My first sales came after I had checked out an independently owned fine dining restaurant that specialized in local seafood, with, of course, many complimentary dishes including salads, garnishes, and cooked vegetables. I found out their wholesale delivery came in on Fridays and on early Friday mornings, the chef was getting ready for the big weekend crowd. That’s when I dropped by quickly with a little box of baby vegetables and heirloom cucumbers picked just hours ago. He took them, more to be polite (or to get rid of me), but later that weekend, a phone call came in. The box I’d delivered was just a recycled cardboard shallow tray box (do be careful of this, though. For example, never recycle a cardboard box that once held meat to deliver fresh vegetables), so no matter where the box was set down, the veggies had to remain visible. With all the chopping and preparation going on, who could resist putting in a few of those interesting new vegetables sitting on the counter. And of course, the chef prepares a little extra to check out the taste. That did the trick. The taste of fresh heirlooms is so superior, that we made a deal for regular Friday morning deliveries. Soon, I was selling baby squashes, gourmet lettuces, heirloom cucumbers, a rainbow of cherry tomatoes, and edible flowers. Another “first contact trick” besides getting chefs to taste your produce is an artistic presentation (see photo of one of my artistic deliveries above). Chefs are artists, and for another restaurant, I delivered a free sample of edible flowers and beautiful lettuces in deep wine reds, buttery Batavian greens, and pink ruffles such as those of Lolla Rosa, all artistically arranged in a lovely, large round wicker basket, with a riot of colored edible flowers in the center. Just the beauty alone sold that particular chef, and he, also, became a regular buyer. Remember to supply your contact information at this first meeting, perhaps in more than one way, such as writing it or attaching it to your delivery box or basket, and also handing the chef and another restaurant worker your card or other written contact information. Ongoing relationships with chefs: Once you get those first chefs interested, you can strengthen and enhance your restaurant garden selling with ongoing relationships with them. Farmer Adam loves to look over seed catalogues in the winter and come up with fresh ideas to experiment with, then talk them over with his chefs. They are often very open to new heirloom discoveries, ideas for new garnishes, and exotic melons that could make their restaurant the talk of the town, if not the region. If you can develop a relationship with your chefs, you will know ahead of time what they might like you to grow next season. This keeps you ahead of any competition, such as wholesalers who decide to carry “big business” cheap organic produce. In some cases, the chefs themselves will make requests. I once had a chef who was visualizing a plate decorated with yellow and red pear shaped cherry tomatoes. He didn’t want any other colors of tomatoes (not even the more unusual oranges or stripes). He knew just what he wanted. Some chefs may even ask you to grow something exclusively for them. If this happens, make sure you have a good commitment for its sale to them, and that the price is high enough to warrant you’re not growing it for anyone else. Keep in mind, too, that this arrangement is often best just for a season. Crops, thank heavens, can not be patented, and a competing chef can eventually discover the talk-of-the-town exclusive fruit, herb or vegetable and find someone else to grow it for him. Hopefully, most chefs, being the independent artists that they are, will be beyond copycatting their neighboring chefs, and would prefer to just come up with something original they can also call their own. At other times, you, the grower, can come up with interesting ideas. Read gourmet and other innovative cooking magazines to spark your imagination. You can also make and send out an enticing list of possible new crops for your chefs to look over during late January, letting them know you need to know their choices by a given date, so you can order seeds and get your garden growing in time. Chefs often love to learn of the history, color, taste and shape of a new crop, with your ideas on possible ways to serve it, such as stuffed, cut into rings, or served quite simply. Carrots served in their rainbow of new gourmet colors can be a delight to chefs. Other gardeners who grow for chefs will sometimes invite the chefs right out to the farm or garden, as Adam does. This helps the chefs see how much work and time goes into the production of their crops, and helps them appreciate you, and support higher payment and stronger commitments to purchase. Prices and thinking of other local farmers, also: Check sources such as LocalHarvest.org to see if you can find prices for items similar to what you’re selling. Farmers’ Markets may also be a good source for prices in your local area. Remember that your organic gourmet heirloom lettuce tended and picked by hand is far different than the overly cheap supermarket iceberg lettuce grown with chemicals and harvested by underpaid laborers. In general, your prices to the restaurant will be retail. Also, the rules about what can legally be called organic change occasionally. Sometimes, the cost to certify is too high for small growers, but in some locations if you sell less than a certain amount, you can claim organic. If you sell over that amount and claim organic without certification, you can be fined, so check current laws in your area, and be careful. Consider other sustainable labeling systems that might better suit you, such as Certified Naturally Grown. There may be other local gardeners or farmers already selling to your local or regional restaurants. If so, consider forging mutually beneficial alliances rather than competing with cheaper and faster. Local farms need to stay out of the cheap and fast lane. Instead, can you grow what the other doesn’t, and together you serve your local restaurants even better? If herbs are already covered by someone else, would you like to expand into artisan foods made from your herbs and/or others’ farmed products, such as herbal cheese made from your crops and another’s goat milk? If you want to get into the business of legally selling homemade food items from your crops, check local regulations first. You may need a certified kitchen or food handler’s permit. In some cases, these are inexpensive and easy to obtain. If you don’t have a certified kitchen and your area’s requirements for them are quite complicated, or you don’t want to install one, you may be able to strike a deal with a local public school or church that has a certified kitchen and will allow you to use it on Saturdays or evenings for low rent or just for the purpose of helping out local farmers. For certain, do not undercut other local regular restaurant growers by simply dropping by with a bumper crop of zucchini or August tomatoes to sell for a buck or two. This can pierce a small but rippling hole in the beautiful and potentially powerful, but young and fragile local food supply economy that’s just now emerging. The nation needs to be fed by local gardeners and farmers. These people need to be paid. If chefs purchase overly cheap crops that suddenly show up without warning every now and then, cutting off their regular local suppliers just for that period, the more regular suppliers cannot earn a steady income, and therefore, cannot depend on earning a living at growing our food supply. Whether you plan to grow and sell just very part time or for a longer season, look first into the bigger picture of what is already going on in your region, and find a way to harmonize within it, rather than compete. And then, don’t forget to take yourself out to dinner now and then. There’s nothing more satisfying than to be served an artistic meal made by a great chef from the crops you grew, and to see your farm or garden’s produce being served to the local citizens or tourists around you. Resource for actually STARTING a restaurant of your own here. The better, smaller, garden hive alternative.